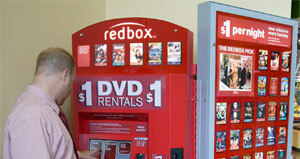 Did you know that every time you rent a DVD from a Redbox kiosk, a puppy dies? Well, that sure is how the movie studios would like to paint it in their current legal wrangling with the popular DVD service. Coinstar, which is known for its green colored kiosks where people can turn coins into paper cash, expanded its business into DVD rentals when it opened its Redbox division a few years ago. While its been gaining in popularity with its $1-per-night rental system, it has also been drawing the attention of the movie studios as a possible cause for their declining sales in the home video market. According to a recent report from The Wall Street Journal (subscription required), sales of DVDs and Blu-rays dropped 13% to $8.73 billion in 2009. At the same time, rental transactions grew 5.5% in 2009, while the spending on rental stock rose less than 1% to $8.15 billion. Seeing as Hollywood studios have come to count on home video sales to help offset the constantly growing budgets of films, you can see where significant drop may start to worry the industry. This is where the legal war between Redbox and the studios begins. 20th Century Fox Home Entertainment, Universal Studios Home Video and Warner Home Video have all banded together to say that Redbox may not have any new DVD release for the first 30 days past its street date due to their collective belief that the $1-per-night pricing structure is cutting into potential retail sales. This has of course led to a lot of back and forth fighting in the courts as the studios and Redbox keep finding new ways to sue one another. The biggest point of contention has come from the fact that the studios told distributors they could no longer sell to Redbox during that time frame. Redbox tried to counter by going to retailers like Walmart, Best Buy and Target to strike deals to buy the films it needed through them, however they discovered that the studios had beat them to it and the retailers could only sell them three copies of any given title. While it isn’t clear how Redbox finally did it, they did secure a source for new movies, but they aren’t getting the quantities they need as they are running out of the newest releases before the weekend. Essentially at least a few of the movie studios are desperate to hold on to an aging business model, but they might as well get used to it not being around any more as we inch closer and closer to a world without physical media. They are still selling copies via the rental market, and in a down economy they should be happy for any sales they get. So next time you walk by a Redbox kiosk, remember you are walking past a device that like to kick the puppies of the movies studios.